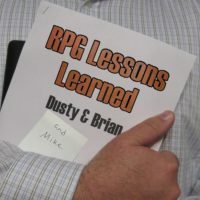 On this episode of RPG Lessons Learned: Dusty talks Brian through planning his first adventure, using Dusty’s Pocket Fantasy RPG Character Sheet Creator. Tom Mix wept. On this episode of RPG Lessons Learned: An Assassin attacks the group! And, uh, he uses a knife. Get it?